Hourly and daily-integrated solar radiation data are available for download for U.S. Virgin Islands, Puerto Rico, Dominican Republic, Haiti, Jamaica and Cuba by clicking here. Examples of the daily integrated solar radiation data are given below. Range of data for 1-km dataset: March 2009 through present. The data set is not entirely complete. Technical problem prevented data from being collected between mid January through mid March 2011. Range of data for 2-km dataset: Early March 2010 through present. The data set is not entirely complete. Technical problem prevented data from being collected between mid January through mid March 2011. Format of data files: The name of the data file indicates where the data is from. RICO signifies Puerto Rico, Culebra, Vieques and U.S. Virgin Islands. CARIB signifies Puerto Rico, Dominican Republic, Haiti, Jamaica and Cuba. Also given in the file name is the julian day and year. For example, 2010079, indicated the year 2010, julian day 79. The extension on the file is .gz, which can be unzipped with any compression software such as WinZip or or 7-Zip and can be downloaded at the following site http://www.filehippo.com . The unzipped file is a text file. If the file is imported into an Excel spreadsheet, you will see three columns of data: column 1 is solar radiation in units of megajoules per square meter per day x 100, column 2 is latitude north and column 3 is longitude west. To obtain the solar radiation in megajoules per square meter per day, simply divide the value by 100. Definitions of terms in the above paragraph: Fortuna is located at the University of Puerto Rico Agricultural Experiment Station near Juana Diaz, PR. UPRM is the University of Puerto Rico-Mayaguez Campus. GDM stands for Gautier, Diak, and Masse, the original developers of the solar radiation estimation procedure. R2 stands for R squared or the coefficient of determination. MBE is mean bias error, and RMSE is the root mean squared error. Still having some problems with the data, related to the tornadoes last week in Alabama. The computers went down at the University of Alabama-Huntsville on April 27th. A solar radiation data set was produced on May 5th, however, Dr. John Mecikalski has informed me that that data set appears to be mixed with the previous day and should probably not be used. May 6th no data. Today, May 7th we have a data set. Lets hope they keep coming. I just noticed that the solar radiation data has not appeared since July 11th. My apologies, I am trying to correct this problem. I will send another post when it is back online. Server still down. Hopefully we can recover the missing data at some point in the future. The GOES satellite sent the raw data and it is recorded on some server somewhere. However, I have been told that the NASA people are working to upgrade the server we use to process the solar radiation data. I will send another post as soon as I hear something. Solar radiation data is back online. Sorry for the inconvenience. 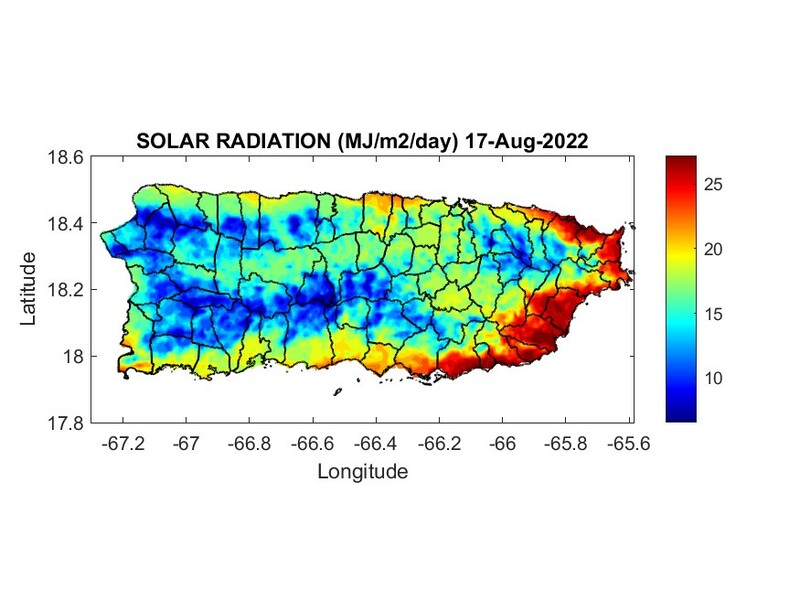 I downloaded the Puerto Rico solar insolation for julian day 1, 2011 and I was wondering how do I interpret the lat and long points that have data -9999 MJ m-2 d-1… Do you have available estimated annual average for Puerto Rico? The -9999 can mean two things. I looked at the INSOLRICO and INSOLCARB files for 1/1/2011 and all values were -9999. In this case it indicates that the solar insolation algorithm could not produce any results, perhaps because the GOES satellite sensors were offline. Alternatively, in the INSOLCARB file some of the outlying coordinates are always assigned -9999 values, since these coordinates are outside of our area of interest. The active area (non -9999) in the INSOLCARB file extends from the USVI to western Cuba, and from below Jamaica to above the top of Cuba. Unfortunately Braulio, the 1/1/2011 file was not a good one to start with. Please take a look at the files for 1/2/2011. Another problem, more common than the one you identified in the 1/1/2011 file, is when the file for a given date is not produced at all. When this happens, you will typically see missing files for a few consecutive days. However, there was a long period when the algorithm server was down from julian day 13 to day 77 in 2011. You mentioned that the data are in units of MJ m-2 d-1, this is not correct. The units are (MJ m-2 d-1) x 100. This form of insolation was used in order to be able to use an integer format. To obtain the data in MJ m-2 d-1 (real format) divide the file value by 100. Sorry but I don’t have any information regarding large solar projects in Haiti. Good luck with your investigation. I would like to encourage the visitors to pragwater to address Bill’s question. Many of the request forms for insolation data that I receive do indicate that they are for PV projects in Haiti, but very few details are provided. The images includes 26 months of data starting in January 2010. Hi, I am having a slight problem.. I am desparately trying to get hourly solar radiation data for jamaica.. i have unzipped the file and i do have micrsoft excel.. however it is not recignizing the file.. it gives me the error “invalid win32 application” could you assist? how do i interpret it now? Rows 1 and 2, Column A and B. These are headers for the latitude (XLAT) and longitude (XLON). You should re-adjust these rows so that the headers in column A line up over the first column of numbers. Unfortunately the numbers for all the hours don’t fit on a single line. 24 times fit on one row and 8 time (for the same day) appear on the next line. What you will need to do is scroll down the page until you come to the XLAT and XLON for your location. Then read off the values of solar radiation to the right. Units for the hourly data are in Watts per square meters. Weeeee, what a quick and easy sootiuln. Excellent!! Data at http://www.soils.wisc.edu have much less resolution…one request though… Could you make available the monthly insolation data for the Caribbean region? I can only find images from Puerto Rico. Thanks for the comment. I take it you are interested in the high resolution IMAGES of solar radiation for the northern Caribbean? If it is the high resolution “data” you are interested in, this already exists at http://academic.uprm.edu/hdc/solar/. I don’t know when I will have time to develop an automated script for making the high res images, but I will definitely put that on my priority list.